Insurers lose millions each year through fraudulent claims. 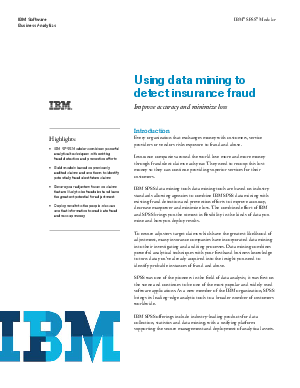 Learn how leading insurance companies are using data mining techniques to target claims with the greatest likelihood of adjustment, improving audit accuracy, and saving time and resources. Read this paper to learn how to combine powerful analytical techniques with your existing fraud detection and prevention efforts; build models based on previously audited claims and use them to identify potentially fraudulent future claims; ensure adjusters focus on claims most likely to be fraudulent; and deploy results to the people who can use the information to eradicate fraud and recoup money.